It was quite nice to have two entire weeks off – no early morning alarm clocks, no traffic, and most importantly, no work! However, as I was soon to learn, there is a major price to pay for that break. Even though I took some time away from the school, the technology gremlins did not. While I was away, the technology gremlins played. My plan was to go into work early on Monday to get a jump start on the day. I knew that the Grade 3/4 class was beginning the Internet technology project, TechnoJourney and I had promised the teacher that I would print the student workbooks. I arrive at 8 a.m. with my flash drive in hand and laptop ready. I send the required pages to the photocopier. No problem! NOTE: TechnoJourney was replaced with TechnoInternet. The activities are similar. Then, problem…the office staff is back and they can’t get their email. OH NO! I head over to the proxy server and am welcomed with a machine that is totally frozen, offers no response, a blue screen, and no logon box…hmmm. I decide to force a restart. The bad news is the Windows why did you shut this machine down dialog box will not appear. Instead my blue screen is now black. It has a message that says something about the master boot record and that I must press F1 to continue. I hold my breath, press F1, and the good news is that after a few moments the server comes back online. Seems there are now issues with the network. My troubleshooting senses are tingling. It has to be something to do with the network switches. 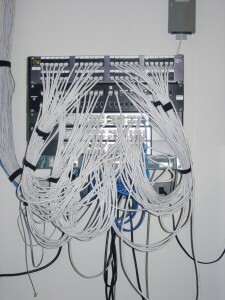 I stare at the rack of spaghetti-like cables coming out of 4 switches mounted beautifully on the wall. AHA! One of the switches has no lights. I wonder if we’ve blown another switch. Wishing that this isn’t the cause of the problem, I reach out my hand and fiddle with the power cords hoping that this simple solution will work instead. It does! VOILA! The lights are back on. The fundraiser ladies are eager to sell gift cards, but the machine won’t connect. The Christmas cobwebs are all gone now, as my brain goes into overdrive trying to figure out this new dilemma. I recall a network line was recently dropped so that the debit machine could connect to the Internet for speedy transactions. I put in a quick call to the guy who dropped the line. Seems he’s not sure if a cable for that line has been connected. OH NO! 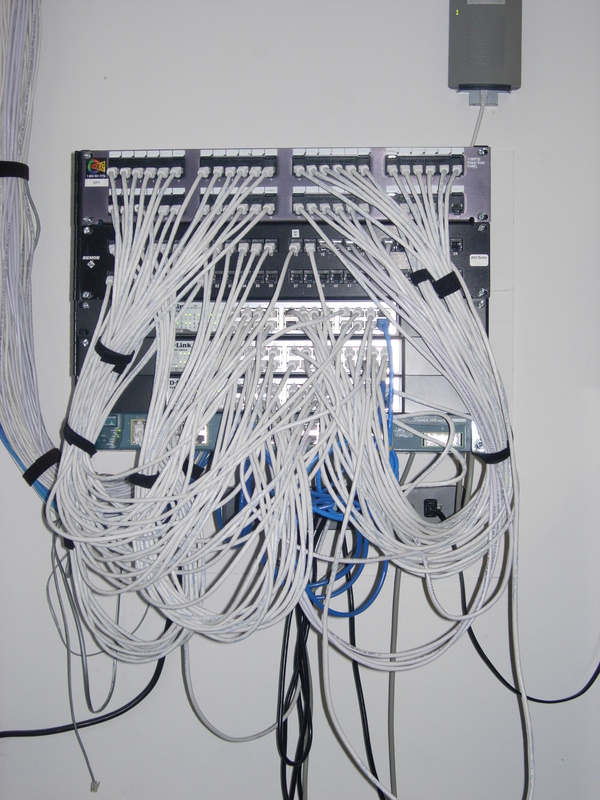 I frantically scan the mess of spaghetti-like wires on the rack. I find the dedicated port for the debit machine and a free spot on the switch and quickly plug in a new cable. Everything is now fixed. GREAT! The main printer isn’t working. UGH! Before the Christmas break the printer was out of toner. To save print jobs from coming out invisible, I decided to turn off the printer. My plan was to have the print jobs stay in the queue on the server and in a day or two when the toner arrived, I’d turn it back on and we’d be back in business. However, this was not the case. After installing the new toner, the printer insisted it wanted to stay offline. Puzzled, I rush over to the server and glare at the printer properties. I start troubleshooting. Is it the Print Spooler, outdated drivers, firmware, or do I need a new patch cable? NOPE! Perplexed, I turn to Google for answers but I could not find anyone with my exact problem. Back to the server. After staring at the printer properties for the umpteenth time I notice that there are TWO devices assigned to the IP address for the printer. HUH? I have no time to ponder how this happened. Instead, I leave the assigned IP on the printer and reassign the second device a new IP address. Now the teachers are back in business. They can print! I feel like I’ve put in a full day and it is only 8:45! What can the rest of the day bring? Those technology gremlins better take a vacation soon – or else I am going to need another one! Annually the school has to complete a computer audit for insurance purposes. Each year the bookkeeper hands me a form that I use to list the hardware used throughout the school. The insurance company requires the name of device, manufacturer, model number, and serial number. With more than 200 hardware devices in use at the school this can be a daunting task…but not this year! Do you have to complete a school network audit? I installed the FREE network monitoring program from Spiceworks. This program can be installed on a server. It scans the network and detects all hardware. Within only thirty minutes I had more than 80% of the information I needed. Spiceworks provided me with a complete listing. The only items missing were monitors and a few routers. I was so pleased! Not only did the Spiceworks network monitoring program save me a ton of time, but it also provided me with additional details about the status of our equipment. This allowed me to quickly review computers that were nearing their hard drive capacity or warranty expiration, as well as those that could accept more RAM to run more efficiently. I heard about this program from a technician at the company BlueRange Technology. Their recommendation was greatly appreciated. In the past, I used a database to manage the school’s hardware inventory logging all the information by hand. However, things can get pretty hectic. When this happens, a donation of a computer or other device can easily get missed. Now I can use the school network monitoring program to keep the records up to date. If you need to complete a network audit I highly recommend Spiceworks.